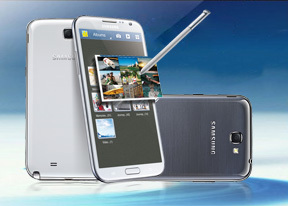 The S Pen truly is the center of the Samsung Galaxy Note II experience. It has a large array of new features that boost its usability considerably over what you can do with just your finger tips. We already covered the contextual page, which comes up automatically when you pull out the S Pen. It's only visible when the stylus is out and it's icon is a little pencil, while regular homescreens are still indicated by dots. Anyway, there's another way to launch apps - with gestures. You press the S Pen button and swipe up to access Quick command. Here you can draw a "@" sign to launch email, or "?" to do a quick search. Besides the symbol you can add a keyword - what to search for with the "?" or recipient, message body or both for the "@" (the Note II will ask which one you want). You can also hover the S Pen over various things to get a better look at them - expand S Planner events, preview emails and text, preview videos and even a position in the video timeline. The Samsung Galaxy Note II comes with a number of cool apps preinstalled. A lot of them are centered around the S Pen, but there are some other nice additions as well. One thing that is not strictly an app, but a cool feature nonetheless, is Smart rotation. It builds on the Smart stay feature introduced with the Galaxy S III - it keeps track of your eyes and will rotate the screen accordingly. This is great for situations where you're lying down and the accelerometer will try to rotate the screen the wrong way. Smart rotation keeps the screen oriented properly. The Gallery app got more updates, not just the Air View features. It now uses a split screen interface - when you go into a folder, the content of the folder is displayed on the right, while adjacent folders are displayed on the left. It's similar to how the file browser in Windows works, for example. The My Files app has a similar split-screen interface, though that one is available only in landscape mode. There's an app called Point&, which uses the Galaxy Note II's camera to scan text. You can translate that text, you can use it to read printed web links or look up the definitions of single printed words (there are English, German, French and Italian dictionaries preloaded). You already saw Paper Artist in the video in the previous chapter. It imports a photo and runs a filter over it (there are plenty to choose from). Then you can go in with the S Pen and color certain areas. S Note should already be familiar to you from the original Note and Note 10.1. It offers several templates and you can enter handwritten notes, regular text with the on-screen keyboard (or handwriting recognition), complex mathematical formulas along with images and voice notes. There's also a floating window version of the app. The S Planner is a skinned calendar that is equally easy to use with fingers and with the S Pen. The tabbed interface lets you easily toggle between year, moth, week, day list and task views. Finally, a really cool feature is the screen recording. It's activated by pressing and holding the Home and Volume up buttons and it records what's happening on the screen (including what you draw with the S Pen) and captures your audio commentary. If you didn't, go back and watch the video in the previous chapter to see these apps in action.